In a world of ultrasonic humidifiers, the BONECO 2-in-1 Air Washer W200 stands out for being a purifier and humidifier. Not only does it use an older, but effective, technology, it looks different. Rather than looking like an appliance that belongs on a hospital bedside, this stylish and sleek humidifier can work well in any room, with any décor. It’s small enough to easily fit on a table, but it also works well on the floor. It can effectively humidify a room up to 540-square feet in size, but it doesn’t require you to hook this up to a water line or carry a tank back and forth full of gallons of water every time it needs a refill. The ease of use, style, and efficacy all work toward making this an excellent choice for any home that needs a little extra moisture in the air. Of course, this type of humidifier and purifier might not be the best choice for everyone. It’s important to understand exactly what you get with this unit, so keep reading to see its features, drawbacks, and what real customers have to say about this air washer. How is This BONECO Humidifier Different from Others? Effectively humidifies 540 sq. ft.
Take a look at the majority of humidifiers on the market today and you’ll probably notice they’re using ultrasonic technology. There are a few benefits to using ultrasonic technology to create humidity, but drawbacks, too. Ultrasonic is also ultra-quiet, despite it using high-frequency sounds to create vibrations, which in turn break up water molecules to produce a fine mist. The problem with ultrasonic, though, is that it also breaks up minerals in your water and emits that, as well, as fine white dust, which can collect all over your house. It’s harmless, but it’s annoying. And while filters are unnecessary, the humidifiers can get slimy and gross in a short amount of time. Cleaning those small tanks are difficult, too. This BONECO humidifier doesn’t require you to buy filters, but it also doesn’t emit the minerals. It even manages to clean the air that’s sucked into the unit of pollen and dust. That makes this an excellent addition to the house of any allergy sufferers. Cleaning the components is also a breeze – dishwasher- and washing machine-safe. Let’s go over that now! 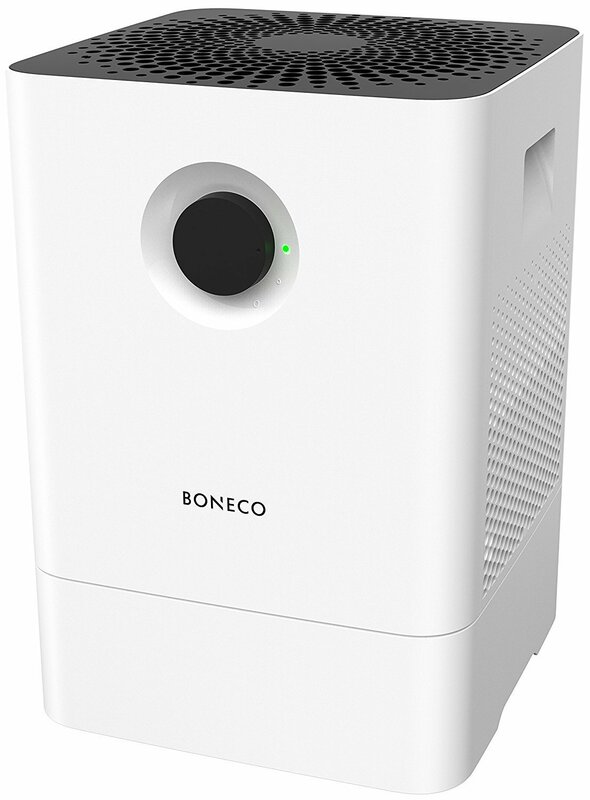 The BONECO 2-in-1 Air Washer W200 looks like nothing more than a small wastebasket, maybe, with a sleek profile, and perhaps some moving parts to make it a bit more tech-advanced. It turns out that this unassuming white and black rectangle is an evaporative humidifier that doubles as a purifier. It could easily sit on top of a table in a hallway, bedroom, living room, or even the counter in your kitchen, but it’s meant to sit on your floor. Unlike so many other humidifiers available right now, this BONECO unit uses evaporative technology. It’s a tried-and-true method to add moisture to the air in your home, without the use of heat. In fact, it’s an all-natural way to not only add humidity, but it also cleans the air it draws in, and then emits a clean mist. The way this unit works is simple but effective. A foam pad acts as a filter for the water that sits in the reservoir. Water soaks into the pad, and the air is drawn into the humidifier. As the air goes through the water in the tank, it’s purified through the water and the filter. What comes out is a fine vapor of clean, cool, moisturized air. 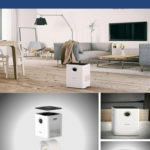 This humidifier and purifier can effectively clear up to 99 percent of the pollen and household dust from a room up to 540-square feet in size. There’s no need for complicated settings or timers either because evaporative humidifiers simply rely on the air in the room to self-regulate. If the air in the room is dry, the humidifier will put out moisture. Once the room has enough moisture, the humidifier will put out less. Most humidifiers have a tank that you must remove and carry to a sink to refill. This BONECO unit gives you another option. You can carry it back and forth if you prefer, but if you’d rather leave the humidifier where it is and bring the water source to it, that’s also a possibility. It’s a top-fill humidifier, making it easy to fill it with a pitcher or gallon-sized bucket. The tank holds about 1.2 gallons of water, so it isn’t too heavy. All humidifiers need cleaning, and this one is no exception to the rule. The brilliant part of this humidifier’s design is that the components that need cleaning are exceptionally easy to clean. Simply remove the top part, pull out the base and the drum, and then place in the upper rack of a dishwasher. The foam pad can be removed, as well, and run through a washing machine. You may want to soak the pad in vinegar or citric acid bath to remove hard water stains or other mineral deposits, but that’s similar for any other humidifier. The biggest difference here is the ability to clean the components in a dishwasher and washing machine. Also, the filter doesn’t need to be replaced often. You may want to buy replacements, but it’s not entirely necessary. You shouldn’t notice any water collecting around the machine, nor should you feel like the room is stuffy where the humidifier is running. That’s because the beauty of evaporative humidifiers is they only humidify as much as a room needs. There are two settings on this unit, though, so you can choose the level of humidity your room gets, but really it’s more about the fan. The high setting goes full force, and it can be a bit loud. The low setting, also labeled as “sleep,” is for when you’re trying to sleep. There’s still sound that comes from the unit’s fan, but it’s much quieter. This BONECO humidifier can handle essential oils, too, so you can use this as a diffuser to add a light scent to your room. The benefits of using a diffuser are plentiful, and they’re only limited to whatever each oil is meant to do, whether that energizes or calm. You should be able to get about 12 hours of runtime out of one tank, but it may be as few as eight hours. It really depends on the current level of humidity in your home, but it also depends on environmental factors, such as whether you have a heater running, and how your insulation is in your home. Frankly, the tank is a bit small and could be bigger. Also, this is an expensive humidifier, especially compared to others with the same runtime and tank size on the market. The build quality and the dual-purpose of this BONECO could be worth it, though. A breakdown of features and their benefits can help you see at a glance whether this humidifier is right for you and your home. Be sure to also see what customers have to say about the unit below. Not only does this evaporative humidifier add moisture to the air in your home, it also cleans the air you breathe. Air is sucked into the unit, and then the water in the tank essentially washes the air, trapping big particles, such as pollen and household dust. The high and low settings really have to do with the fan speed. Set it on high and you get lots of air and humidity pushing through at a quick speed. Go with low and the sound of the fan is lessened, which means it may make sleep more possible if you’re sensitive to sound. Parts are easily removable, so you can disassemble this unit and then place the drum and base in the upper rack of your dishwasher. The foam pad is machine washable, so you can add it to your washing machine, though a soak in citric acid solution or vinegar-water mix helps clean it. The 1.2-gallon tank can add enough humidity to cover a room up to 540-square feet in size. It also works well for smaller rooms, and it won’t over-humidify a room. Add essential oils to the aroma pad to your heart’s content. It won’t void the warranty unless you add the oils to the water in the tank. The benefits of essential oils go beyond adding a lovely scent to the air. Although no filter or additives are needed to provide you with clean humidity, a pad that acts as a wick is included. It can be washed regularly, but if you ever do need to replace the wick/pad, you can. Never underestimate the power of the customer review. Those who have purchased this humidifier-purifier combo have first-hand experience with using it, cleaning it, and troubleshooting any issues. Almost unanimously, customers agreed this was an easy-to-use humidifier. You just plug it in, fill it up, and turn it on. It’ll pump out humidity when it’s needed, and then shuts off when it runs out of water. Having a humidifier with parts that are machine washable makes this super easy to clean. Consumers loved that they can just throw everything in the dishwasher and washing machine to get everything clean once per week. Overall, those who bought this humidifier love the top-fill option. It’s incredibly easy to remove the tank for filling or pouring water from a pitcher. Not everyone was impressed with the amount of humidity that they got out of their machine. Some said it was minimal, while others said it pumped out enough moisture to raise the humidity in the room to 60 percent. Results will vary based on your environment, as with any evaporative humidifier. As long as you aren’t sensitive to sound, the fan noise shouldn’t be an issue, as most customers said the sounds coming from this humidifier were soothing, if anything. The five-year warranty is much longer than for most humidifiers, but most people haven’t had to use it. A couple of reports of defective units are out there, and customers were able to return units easily enough. The two settings are all consumers seemed to need for this humidifier. Most people used it on the high setting, but some people preferred the low setting for nighttime use, which reduced the fan noise. If there’s anything that gets a negative score from consumers, it’s the size of the tank. At only 1.2 gallons, this humidifier may need refilling more often than you’d like. Humidity in your home is important. You don’t want too little or too much, as either way can cause issues. The BONECO 2-in-1 Air Washer W200 uses evaporative technology to create humidity, which means you’ll always have a just-right amount of humidity in the room where this unit resides. The design of the unit means this will fit in wherever you place it – the white and black look great with any décor, and the size and shape of this humidifier is unobtrusive. Not only does this humidifier put moisture back into the air, it cleans the air it uses to create evaporation. So, the air it sends back out is up to 99 percent clear of pollen and household dust. While the humidity helps reduce your congestion and dry throat, the cleaner air can help alleviate allergies, if you suffer from them. You can safely add essential oils to the aroma pad, and the unit is easy to clean. Just toss the components in the dishwasher and the wick/pad in the washing machine. Yes, this is an expensive humidifier, but it very well could be one of the best humidifiers available on the market, for what it does, what it does not do, and what it allows you to do.